Right from birth, your baby has a very defined sense of hearing. In fact, a newborn’s hearing is almost exactly the same as an adult’s. However, while they may be able to hear perfectly, babies don’t yet understand what the noises are, or where they come from. This can understandably be really frightening for your little one, leading them to become extremely upset whenever they encounter a loud noise. So, how should you handle your baby’s fear of loud noises and is it something you need to be worried about? It’s said that babies have two main fears – loud noises and the fear of falling. This is likely down to the fact they have very immature nervous systems; making it difficult for them to interpret various sensory inputs. So, when they hear a sudden, loud noise, they’re likely to react in shock and either cry or fling their arms and legs out, before clenching their tiny fists. Physical responses such as crying, are the only thing a baby can do to express their fear or shock. It’s also worth pointing out that a noise may not even seem loud to you, but for baby’s sensitive ears it could definitely sound louder than it is. This initial fear of loud noises will usually start to fade as your little one becomes more aware of what the noises are. However, at around one year of age, it’s possible the fear could return. This is because at this age, babies start to want more independence, as well as to control their environment. So, if there’s sudden noises they cannot control, such as thunder, it could cause a lot of upset. Are All Babies Afraid Of Loud Noises? The majority of babies go through a phase of being afraid of loud noises. However, some are more sensitive to sounds than others. Just like adults, each baby is different, and some may be totally chilled out when it comes to hearing new sounds. They may be more mesmerized than afraid. Babies who do go through a phase of being afraid of loud noises, usually tend to get better with them after around two months. They may still become startled if a loud noise occurs, but the fear response won’t generally be as severe as it once was. What Types Of Noises Are Babies Afraid Of? When you think of loud noises, you typically imagine fireworks, an explosion or something being dropped onto the floor. While these noises would definitely startle baby, it’s actually more common household noises which can cause the problem. Some babies don’t really get too scared by any noises, while others may be afraid of even the slightest noises. The vacuum, washing machine, a dog barking, a hairdryer, juicer or even the television can all frighten your little one if they’re especially sensitive to loud noises. So, if your baby is scared of everyday noises, don’t worry it’s still a normal part of their development. Will They Always Be Scared Of Loud Noises? Most babies get over their fear of loud noises once they get a little older. When they can start to understand where noises are coming from and what they actually are, their fears will automatically go away. However, there is a possibility the fear will stay with them throughout their childhood and potentially adulthood too. This is actually a condition known medically as Ligyrophobia. It’s also sometimes referred to as Phonophobia and is basically a fear of loud noises. If a child is scared of noises for more than six months, it’s worth taking them to see a medical professional to determine whether they could be experiencing an actual phobia. Is There Anything I Can Do To Help Ease Baby’s Fear Of Loud Noises? 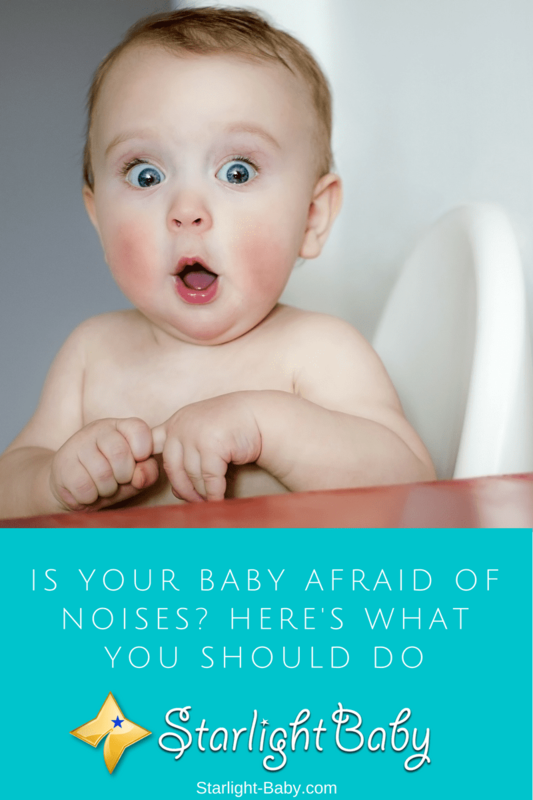 There isn’t an awful lot you can do to help ease baby’s fears of loud noises. If they’re especially sensitive, it may seem like a good idea to minimize the noises they’re exposed to. However, doing this could actually make the problem worse. If baby isn’t introduced to new sounds and they’re shielded from loud noises, when they do inevitably experience a loud noise, they’re going to find it even more startling. So, instead of trying to eliminate loud noises completely, it’s a better idea to gradually increase the amount of background noise there is within the home. Listen to the radio on a low volume and gradually start to turn it up after a few weeks. Don’t be afraid to use loud appliances such as the vacuum, but start by using them in a room away from your newborn. That way, they’ll still be able to hear the noise, but it won’t be too loud that it startles them. You can start vacuuming nearer to baby gradually, to build up their noise tolerance. If your little one gets upset after hearing a loud noise, simply pick them up and talk to them soothingly. Explain what the noise was. They may not fully understand you, but saying something like “Well, that was a loud noise wasn’t it” and then tell them what it was. Remember, for very young babies, skin-on-skin contact can be especially soothing, so hold them close and just reassure them that it’s okay. When baby is a little older, you could also try turning loud noises into a more positive experience. For example, playing a game and making loud noises such as banging on a toy drum, or saying something like “bang, bang” loudly and excitedly, can help to turn loud noises into a fun, positive thing. Of course, this won’t work for all babies, but it could definitely be worth a try. Overall, it is totally normal for babies to be afraid of loud noises. It doesn’t necessarily mean anything is wrong or the fear will stick with them. However, if you do notice the fear lasts longer than six months, it is worth mentioning it to your pediatrician or doctor. They’ll be able to tell you whether the fear is a normal part of baby’s development, or whether there may be something else contributing to it. Thank you for this educative post. My mother used to throw some utensils down intentionally just to watch the baby’s reaction. My sister was few months old back then. Although she never cried, she was extremely shocked and her little eyes would open wide facing in the direction where the sound came from. Haha, I could just imagine what your mom did to get rid of your sister’s fear of loud noises. From what you said, it sounds effective. I have also heard of that “technique” before but I never tried it on my kids, haha. I guess my baby is one of those that aren’t afraid of loud noises. He just never showed any fear even when he heard something completely new. But it’s rather interesting how different babies can be and that’s why this article is highly beneficial for many mothers. Just remember to not panic if you see your child afraid. You’re the parent and you need to calm and soothe your little fellow – talk to them and tell them what it was. If they understand it, they will not be afraid of it. That’s true, Jane. It applies even to adults – we fear what we do not know. You’re lucky to have a “tough” baby. As you said, all babies are different. It’s unfortunate there are no real ways to help a child immediately get over the fear of loud noises. I do like the idea of things like vacuuming in another room at first and gradually turning up the volume on the radio over time to get the child more accustomed to such sounds. Noise are annoying sounds that irritate most of us and makes babies afraid of. Make nice sounds or play music that makes the baby comfortable. Everyday the baby is growing so we can make the necessary adjustment about coping up noise and overcome their fear about it. Make it in a fun way would be better. Starting with the different sound of animals would be a great start. While I was a kid, my mom said that I always get scared each time we had visitors and there was noise on the background. She said that when she noticed that, she always ensure that I was carried out of the place at that time. So, I’m an evident of a kid that got scared of noise and I’m glad to learn more how to control it through this post. When my first born was young, I used to tip toe around.. god forbid use a hoover because he would get frightened.. it was a nightmare.. will definitely consider your tips when baby number two arrives!! Thanks for posting this kind of article. As a mom of two. I experience a lot of this especially when putting my baby down for a nap in the afternoon, and my babies wake up easily because of loud noises like dogs barking or even if it is just someone knocking on the door, or ringing the door bell. This article proved that I am doing the right thing. I pick them when they cry or get startled, I comfort them and tell them it’s going to be all right. White noises worked too like the sound of an electric fan. I’m happy to know that exposing them gradually to loud noises really helps. Thanks again. Very interesting information. I always thought that it was kind of a personality thing. For example, my first born never seems to get bothered by anything, loud noises, separation anxiety, another child taking a toy he was playing with. He is just very laid back. On the other hand, my second son seems to react to everything. Fortunately for me, my oldest is very nurturing and helps to comfort his little brother. I think he’ll make a great dad someday! That’s adorable! What a good big brother to help out like that! From my observations, naturally babies are all scared of loud noises, be it from music, fireworks, metal clanging, car sound, generators etc. All these tend to scare them, it’s not a that there is anything wrong with the baby but simply because the child is yet to adjust fully to his new environmental surroundings. Their ear drums are still too tender and too sensitive to loud noise. I wouldn’t advice such children exposure to such loud sound, as I happen to believe it would cause damage to their sense of hearing. My baby is not afraid of noises. Loud noises makes her fall asleep. Lol! Loud noises somehow makes her feel safe I guess. When I was a kid, hearing noises at night from people talking made me feel safe and eventually fall asleep. The first baby that I watched closely was my nephew. He liked the noise. If there was a silence in the room, he used to cry. However, my six months old baby does not like noise. I have a habit of talking loud, and whenever I talk loud, the baby startles, if the noise continues, he begins to cry. Perhaps, the baby got this habit from his mother who is soft spoken. When my big sister had a baby, i learned that babies do not like loud sounds. Specially those loud banging sounds like when you dropped something or you shut the door loud enough to wake a sleeping baby and make her cry hysterically. My big sister would always remind me to always keep quiet and move quietly to avoid waking the baby when she’s asleep or to scare her and make her cry when she’s awake. So i kept that in mind up to now that i have my own little girl. Now I know why my niece become rattled every time she heard a loud noises. Every time we play a hard rock music when my niece is playing I noticed that she becomes rattled and she cries and it is because rock music is too noisy for the babies. Now that I already read this I can now apply all of this to her. And also hearing loud noises is bad for the babies because their ear drums can’t handle it. This is very informative. Thank you so much for sharing this with us. I have 2 year old baby and when he was one he was very scared of loud noises. At first I and my wife thought that there was something wrong with our baby, which I realized was unfair to him. We had this kind of thoughts because his cousin is also afraid of the noise but not as much as he was. But now he is two years old and not afraid anymore he is doing fine now. So now after reading this article I just realized that is normal. Thank you very much for sharing this I appreciate it. When our daughter was just 6 months old, she doesn’t really want to hear loud banging noises. She would immediately cry whenever she hears it. And the worse thing is, she would even have nightmares because of it. That’s when we realized that she should never hear those loud banging noises to avoid those unwanted behavior from her. And now that she’s one year old, she’s accustomed on most loud noises that she hear and that lessened our worries about her crying a lot and having nightmares because of that. My daughters were also afraid of noises, each noise they have encountered I tried to make something of it as a learning tool by letting them here it again, but in a low volume using the same audio sound from the internet, then everyday I tried to turn the volume up just like what you said. And it helps a lot making them accustomed to that noise and no longer be afraid at all. This article made me realize I have done something right when they were young. Thanks a lot!